The Decorative Hummingbird Feeder. A Beautiful Choice. 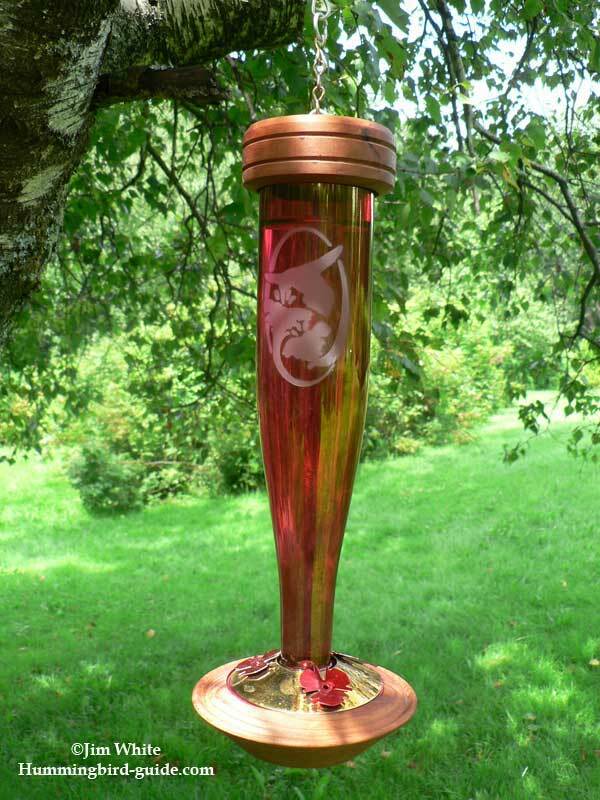 A decorative hummingbird feeder is often made of blown glass sometimes etched or hand painted complimented with copper or wood. These have come along way from the first feeder that was made from a test tube by a scientist dabbling in his laboratory. The first feeder created by the scientist was actually a gift to his wife, who loved to observe hummingbirds. The feeder in this video is one of our and our hummingbirds favorite! We have 12 hummingbird feeders hung around our house and this one is one of the busiest. We have had this particular feeder for 4 years and it has held up well. The glass has kept it's color (sometimes red glass will fade) and the base still looks like new. 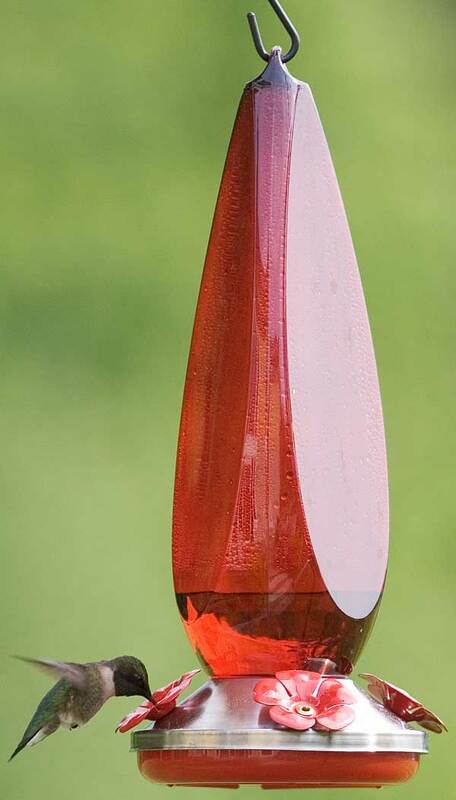 Details of the Ruby Faceted Hummingbird Feeder. We have several of this model hanging in our hummingbird flower garden and around our house. We particularly like the beauty they add and their durablility as a quality feeder made to last. They are constructed of glass with a redwood and brass base, making it a very fancy hummingbird feeder. The redwood base can be be easily restored to its original appearance by sanding and applying a natural wood oil when it has been weathered by the elements. See my Schrodt Etched Hummingbird Feeder Review. This love of hummingbirds has seen a tremendous growth of popularity through the years. The popularity of observing hummingbirds has inspired the manufacturing of some feeders lavished with materials resulting in these decorative feeders. Of course they are usually more expensive than a basic plastic feeder. However, the investment can supply an elegant piece of craftsmanship for your hummingbird viewing pleasure. These will be more durable with a longer life expectancy. Here is the "Fairy Dust Hummingbird Feeder" made of brushed chrome with a gold finish. This is an example of a unique feeder with individual nectar pots adding to the beauty and the ability to serve several hummingbirds at the same time. 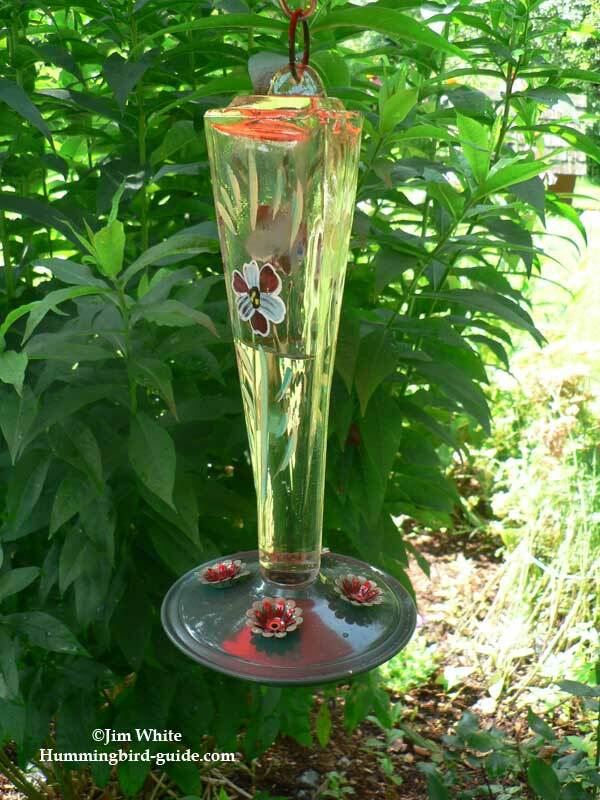 This imaginative style decorative hummingbird feeder will compliment any patio, porch or deck of your house. It seems most beginner hummingbird observers start with simple plastic feeders. Just as we did years ago. After a few failed or deteriorated inexpensive feeders, we look for more durable models. As long as we are willing to make a larger investment, we search for more elegant styles. This model is a handcrafted hummingbird feeder which is hand painted. Made of clear glass with a painted metal base and bee proof flower ports. The feeding ports are very "Bee Proof" since the holes are too small for bees to enter but large enough for our hummer friends to quench their appetite. This is hanging from a sheppard staff in one of our several hummingbird flower gardens which put a finishing compliment to our hard work. 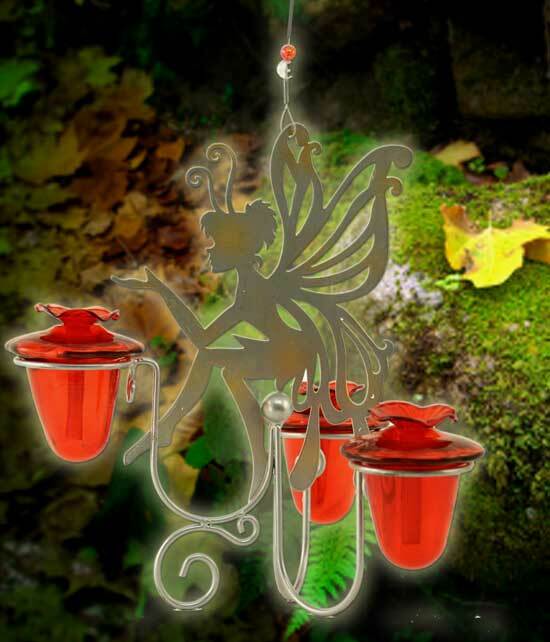 The decorative hummingbird feeder is a popular gift for many occasions such as a birthday, Mother's Day, Father's Day, Valentines Day or any time you would like to give a gift. A hummingbird feeder paired with a brush kit, a bottle of "Ready-to-Use" nectar or a nesting kit will delight any hummingbird lover! Details of the Ruby Prism Feeder. It's the shape of this feeder that sets it apart. 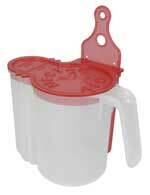 This feeder is made of red glass with a silver metal base and bee proof flower feeding ports. Of course we know that hummingbirds are attracted to the color red. It is not necessary to use a red feeder or red nectar but this may help to attract hummingbirds when you are hanging feeders for the first time! Another tip to initially attract hummingbirds for the first time is to hang large red ribbons around your feeders. See our Tips/FAQ page for more ideas. Today the tiny hummingbird is loved in a giant way! With such high demand, new feeder styles are constantly being developed. Whatever your taste, there is a decorative hummingbird feeder for you. 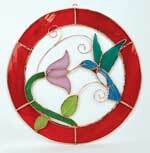 We enjoy giving beautiful feeders as gifts to family and friends. After all, everyone loves hummingbirds!